Come over to the cutest kitchen in town and see what's cooking at the Chef's Club! 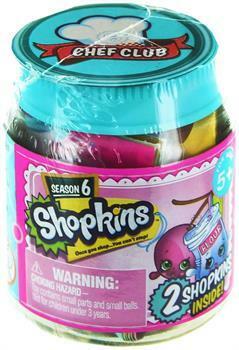 This season each Shopkin is an ingredient in a deliciously fun recipe! Collect all the ingredients and search for the Limited Edition "Finished Dishes"! There are Breakfast meals to make, sweet things to bake, Family foods to prepare and baked goods to share! Each 2 pack comes in a cute recipe book container that can be stored in the playsets! Inside the book is a very cute recipe card! So C'mon, lets start cooking! Each 2 pack comes in a cute recipe book container that can be stored in the playsets!